They're back! While Amputecture has earned a very special place in my life and is certainly a near masterpiece, it was quite a difficult listen. Aside from a few segments, nothing clicked the first time around, and even the second time around for much of it. I would grow to love it, but couldn't help the feeling that it didn't stand up next to the two brilliant-beyond-words albums preceding it. 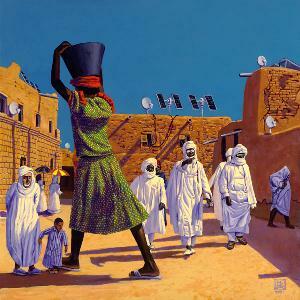 But with The Bedlam in Goliath, The Mars Volta have created a very fast-paced, aggressive yet both funky, melodic/memorable and powerful record that comes close to equaling De-Loused in the Comatorium and Frances the Mute. Thomas Pridgen's work is something to marvel at. This material suits him very well, though I really couldn't see him being able to play the less-is-more style of Jon Theodore (comparatively of course, as no one could say that Theodore's work was simple). Here, the music facilitates Pridgen's bombastic style perfectly. Cedric's vocals have a lot of effects throughout, which I'm not entirely fond of, but there are plenty of cleanly-sung melodic parts that are going to strike your soul with their beauty. Everyone else is on top of their game, and of course the sound is huge. To quickly sum up the highs and lows of the album: the band is always their best when they're not trying to be as dissonant, cacophonic and inaccessible as possible. When the bass and drums lock into a groove, Cedric sings clean melodies and the rest of the band provides the rest, they achieve some of the most amazing moments of music history. Part of the reason that the recent works don't reach the heights of years past is due to the direction the band decided to take with Amputecture. Melodies are now more often buried by vocal effects or paired with often high-pitched (given that the root melody isn't the high one) and dissonant harmonies. And if that isn't the problem, it's that the songs are starting to sound a bit too fractured. The highest points of the album are Metatron, Goliath, Agadez, Ouroborous and Conjugal Burns. The only tracks that take some getting used to are "Tourniquet Man," which seems a bit undeveloped and has some almost repulsive vocal effects, then "Cavalettas," and "Askepios" which are very fractured, but each individual idea in each song is quite solid. I would hardly consider them bad tracks, though. After a few listens, you should appreciate them. The tracks not mentioned are all fantastic, but, if only to prevent my high point list from contained 75% of the record, don't reach the same climactic heights of those mentioned. This album is amazing. It's long, but it feels as quick as De-Loused, which is 15 minutes shorter. No songs over 10 minutes long here; the songs are as short as 2:36 and as long as 9:32. It's a fresh output in all aspects for the group, and an absolutely mesmerizing one at that.